A few months ago, it was reported that the Nintendo Switch contained a security vulnerability in its Nvidia Tegra X1 processor that had the left the console open to exploits, including homebrew software not approved by Nintendo. Because the problem was in the processor rather than in the console’s operating system or other software, it couldn’t be patched, but new Switch units hitting shelves appear to have solved the bug. Nintendo Switch users have reported that new consoles are no longer vulnerable to “f-g,” short for “Fusée Gelée,” an exploit in the processor’s USB recovery mode that could be activated to remove protection on the systems’ bootROM, thus allowing them to run software the Switch normally wouldn’t run. Though Nintendo has always kept its online stores relatively regulated, it was likely the risk of pirating games that spurred its decision to update the console itself. For most Nintendo Switch users, you aren’t going to notice one bit of difference from the previous version of the system, but it will undoubtedly cause problems for those looking to emulate GameCube games. The popular emulator Dolphin was recently adapted for Switch by a team of enthusiasts, allowing The Legend of Zelda: The Wind Waker to run on the system via Linux. Dolphin on Switch made use of the Fusée Gelée exploit, so it could be impossible to do so on the newer consoles. Reddit users have already begun speculating that older Switch consoles will be sold at higher prices on third-party sites due to still being vulnerable to the exploit. Dolphin is most popular on PC, and it can be used to play GameCube and Wii games. Using downloaded ROMs of video games through emulation software remains a bit of a legal gray area, as some have made the argument that those who already own a legally purchased copy of the game can download another copy to play on a different system. Nintendo’s stance on emulators and ROMs is more black-and-white, with the company claiming doing so is illegal in all instances. Without a Virtual Console service on the Switch at the moment, however, Nintendo isn’t giving players much alternative for playing their favorite classic games on the system, though the paid Nintendo Switch Online service will include access to a vault of older titles. For the first time since 2013 PS4 is not going to be the most sold console of the year. Nintendo Switch has had a trailblazing run since it was launched last year by selling an incredible 5 million units. It has already become the fastest-ever selling console in the first year of its launch, and is all set to change the dynamics of the console gaming market this year. If reports are to be believed, the Sony PlayStation 4 is all set to make way for the new kid on the block that is the Nintendo Switch. As of March 2018, Nintendo has sold nearly 18 million Switch consoles worldwide. According to a prediction by Matt Piscatella of the NPD Group, the Nintendo Switch will be taking over the crown from Sony’s PS4 as the most-sold console this year. Nintendo Switch will has a field day selling itself in the holiday season, and its fall lineup of releases that include Pokémon: Let’s Go, Pikachu! and Let’s Go, Eevee! and Super Smash Bros. Ultimate will be sealing the deal. Sony’s PS4 has been consistently winning this crown beating out its biggest rival the Xbox One since its launch in the year 2013. But what is truly fascinating about the prediction is that it does not include a single Nintendo Switch game. This might suggest that the console is a hit because of the array of games it provides and not just a few titles. The good news is not just for Nintendo Switch, but for Xbox One and PS4 as well. The Xbox One and PS4 combined sales will be overtaking the Xbox and PS2 sales which is a good news for the growing gaming industry. As part of a short video recently shared on the official Nintendo of America Twitter account, head of software development Shinya Takahashi confirmed that Mario Kart 8 Deluxe isn't done getting software updates. At least, not quite yet. “Hello, everyone. I am Shinya Takahashi from Nintendo. Now you are able to play Mario Kart 8 Deluxe using the Nintendo Labo Toy-Con Motorbike. So whether you’ve been using bikes in Mario Kart 8 Deluxe or not, please try playing with the Nintendo Labo Toy-Con Motorbike. Mario Kart 8 Deluxe hasn't been getting regular updates in 2018, with this year's only update dropping in mid-June adding Labo Motorbike support to the game. However, that was a really nice little update that added something fun and substantial to the game. It seems like Nintendo is being thoughtful about how it updates Mario Kart 8 Deluxe, and if there's more to come, I won't be saying no to that. Unused feature has been hidden in Animal Crossing for nearly two decades. Fans of the early-2000s era GameCube version of the original Animal Crossing likely remember the game including a handful of emulated NES titles that could be played by obtaining in-game items for your house. What players back then didn't know is that the NES emulator in Animal Crossing can also be used to play any generic NES ROM stored on a GameCube memory card. Security researcher James Chambers discovered the previously unused and undocumented feature buried in the original Animal Crossing game code and detailed his methodology and findings in a technically oriented Medium post this week. The key to opening Animal Crossing's NES emulator is the game's generic "NES console" item. Usually, this item simply tells players who try to use it that "I want to play my NES, but I don't have any software" (separate in-game items are used to play the NES ROMs that are included on the Animal Crossing disc). While searching the Animal Crossing code for access to hidden developer menus, though, Chambers discovered that activating this in-game NES actually causes the game to mount and search the player's memory card for valid NES ROM files, using functions like "famicom_get_disksystem_titles" and "memcard_game_list." After a good deal of debugging through an emulator, Chambers deciphered the specific file format needed to get Animal Crossing to recognize NES ROM files stored on the memory card, which involves inserting specific checksum, file name, and ROM header values in specific locations before the game data itself. After a bit of metadata and emulator tweaking, Chambers says he was able to load Mega Man, Pinball and Battletoads onto the GameCube through the in-game emulator, as well as a homebrew test ROM created years after Animal Crossing was made. Interestingly enough, Animal Crossing's memory card access hole also leads to a buffer overflow error that can let users execute arbitrary, user-defined code on the GameCube itself. 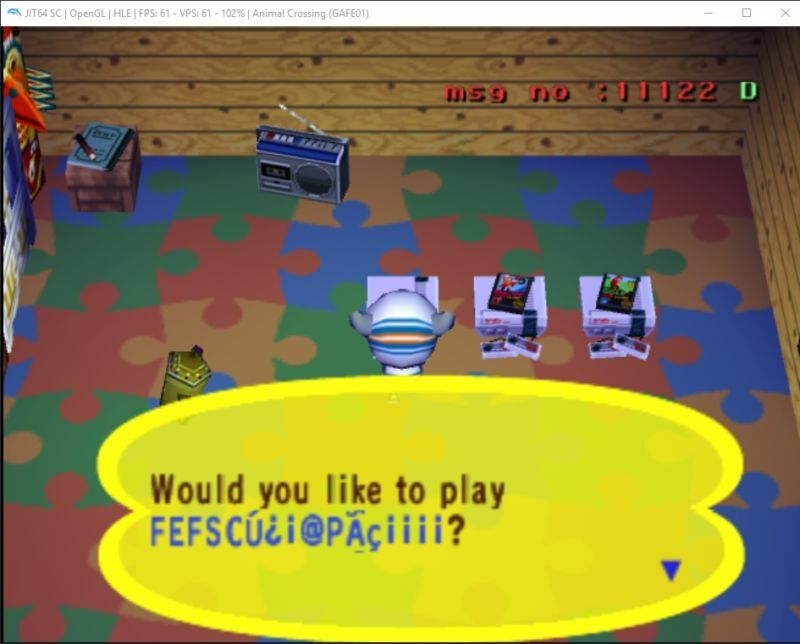 One Animal Crossing hacker has already demoed how this method in a stock copy of Animal Crossing, but the same general method could load homebrew code onto the GameCube without the need for hardware mods or external cheat devices like the GameShark. While being able to load NES games onto a GameCube is fun, the most interesting part of this discovery is probably what it suggests about an unexplored branch of potential Nintendo history. Remember that the code to load NES games from a memory card was put into Animal Crossing by Nintendo decades ago, not by some modern-day modification of the original game code. That strongly suggests Nintendo was at some point planning an official way to load additional NES files into Animal Crossing through the memory card. It's hard to say how this distribution might have worked. Maybe special ROM-packed memory cards would have been included with new editions of the game (Nintendo actually did sell versions of the game packaged with memory cards that unlocked special presents for players). Maybe Nintendo would have given such memory cards away in contests. Or maybe, in an alternate timeline, a machine akin to Japan's Japanese Famicom disk-writer kiosk could have let players load NES games onto their own memory cards. Regardless, it seems that Nintendo may have been planning ahead for some form of retro-game distribution long before the Wii Virtual Console became a thing in 2006. And if you want to make use of Nintendo's unused GameCube-to-NES emulation features today, Chambers has released GitHub source code that lets you generate your own Animal Crossing-friendly NES ROM files. You can test out those files for yourself using a virtual memory card loaded into the Dolphin emulator or on an actual GameCube using special memory card hardware. A poll conducted by Nintendo-dedicated site Nintendo Life has found that 20 percent of over 1000 users polled had seen their Nintendo Switch develop cracks in its plastic around the fan exhaust – and Nintendo repair costs aren’t exactly cheap. Nintendo Life decided to conduct the poll after members of their staff experienced the issue of cracks emerging in the Switch around the machine’s fan exhaust. 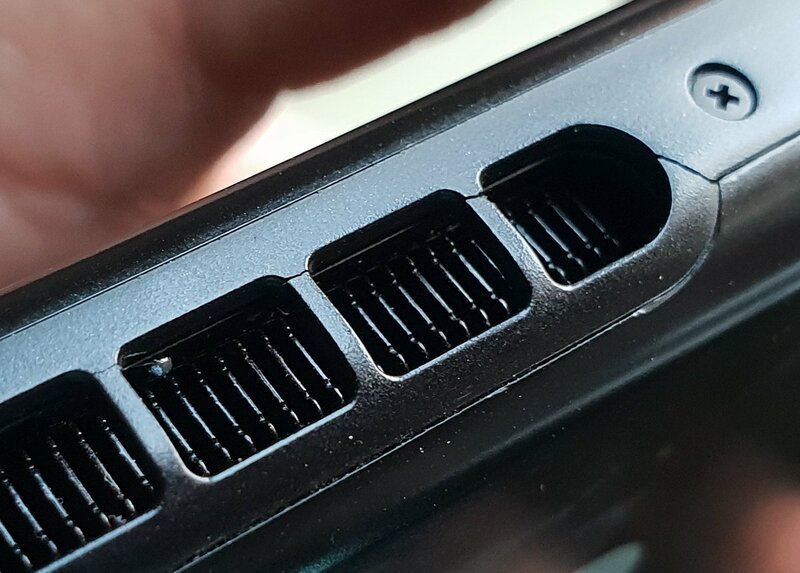 The cracks emerge as tiny hair-line cracks, and the site speculates that it’s due to the heat the Switch kicks out from this port, the primary ventilation area on Switch hardware. You can see some of the cracks in the photo below, snapped by Nintendo Life’s editor. This story also caught our eye on VG247, as a few of us have also experienced cracking in this exact same place on our Switch consoles. I’d honestly chalked the cracking around my exhaust grill down to natural wear and tear, but the sheer number of reports and photographs of practically identical cracks on other machines now has us pondering if in fact there’s something more to it, and if the plastic used on the Switch just simply isn’t up to the task of handling the heat kicked out by the machine when it’s running heftier games. What’s worse for fans is that if this issue occurs Nintendo appears to regard it as accidental damage, with readers of Nintendo Life showing the site correspondence with Nintendo support where they make clear the company considers the issuer the result of accidental damage and thus not covered under the standard warranty. As a result Nintendo UK are charging anywhere between £150 and £180 to repair the issue – a good two thirds of the price of the Switch itself. Ouch. “After checking in with the European team we can confirm that we haven’t received a notable number of consumer inquiries on this topic,” Nintendo said to Nintendo Life in a statement. The results of Nintendo Life’s poll and the sheer number of photos sent to them of near-identical cracks suggests at least a design weakness if not an outright fault, however. The Nintendo DS Lite suffered a similar cracking plastic issue around the hinge, but back then Nintendo would replace machines impacted by that issue at no cost. Has your Switch developed any of these cracks or problems? Let us know in the comments below. If your smartphone of choice has forced you to upgrade to wireless headphones, you probably hate having to swap them out for a corded pair when you want to play your Nintendo Switch with a little privacy. The portable console doesn’t come with Bluetooth, but a tiny dongle called the Genki does, theoretically making it easy to upgrade your Switch so it plays nice with your wireless headphones. The Genki plugs directly into the Switch’s USB-C port, where it should have direct access to a digital stream of your game’s audio. As a result, there should be less lag than when using a Bluetooth adapter plugged into the Switch’s headphone jack, which requires digital-to-analog and then analog-to-digital conversions as extra intermediate steps. The Genki also draws all the power it needs while connected, so you’d never need to charge it separately. The makers of the Genki claim it actually allows two sets of wireless headphones to be connected at the same time, so you can head-to-head game with your seat mate on your next flight without disturbing other passengers. 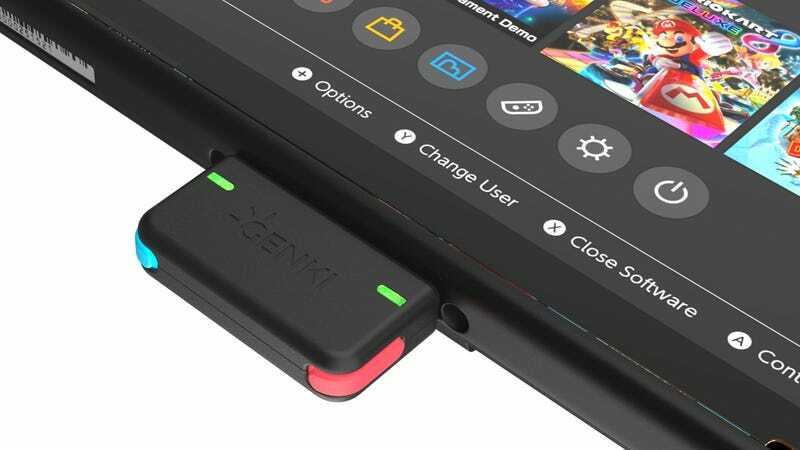 And because the USB-C port is used when the Switch is docked, the company also claims the Genki works with a USB adapter so it can be plugged in to the old-school USB port on the back of the Switch’s dock. The creators of the Genki have gone the crowdfunding route to help put the dongle into production, with a $30,000 Kickstarter campaign that’s already raised over $300,000. But that is in no way a guarantee that the Genki will make it into backer’s hands without any hiccups or delays once it moves towards manufacturing. If you’re willing to take the risk, a pledge of $39 gets you just the Genki dongle, or for $10 more you can get it with a USB-C adapter so that it works while the Switch is docked. It’s certainly not the cheapest Switch accessory out there, but if you spend all day long with AirPods jammed in your ears, the cost of upgrade might be well worth it. Last we heard from TX they were searching for Switch'es that have been patched by Nintendo in the factory, and they have just announced today that support for these so-called "unhackable switch'es" will be coming in due time from the developers at Xecuter, so stay tuned for more news regarding this amazing development in the near future, in the meantime, read their official announcement below regarding the IPATCH changes as they slowly work on getting to the bottom of it, and finish working on releasing complete SX PRO and SX OS support in due time! Dear fans, we hope you're all enjoying your weekend! Recently, it has come to our attention there's a new revision of the Nintendo Switch in the wild which is incompatible with our SX Pro product. This isn't simply an incompatibility with SX Pro but rather appeared to be a fix of the infamous "USB RCM" exploit. One of the IPATCH entries in the fuse set (entry #3) has been replaced with a new patch. The old patch patches the bootrom location 0x10fb3c with the value "00 20" (mov r0, #0 in thumb), and the new patch patches the bootrom location 0x10769a with the value "00 21" (mov r1, #0 in thumb). This new patch effectively zeroes out the upper-byte of the wLength field in the USB RCM endpoint 0 handling code. Those who are paying attention probably wonder how we know the exact details of this IPATCH entry change, since we can't read out the fuses without our precious USB RCM exploit, right? It is a classic chicken and egg problem. The answer is obvious: There is more than one coldboot bootrom exploit, and it is not just the warmboot one. So don't fear: we will deliver a solution for these new "unhackable" switches in due time! Team Rebug has been overwhelmed with the support they have been getting for the pre-order launch of their SwitchMe internal dev board, as such they have just recently announced plans on their Twitter for an upcoming SwitchMe external dongle, which they are calling an Xecuter SX PRO on steroids. Male usb C, female micro usb on the bottom, and a cr2032 coin cell on the bottom. 3d print one, because tooling a case takes too much time and you need a huge order to even make it worth while. @evilsperm is saying they are about a month away from launching the 'dongle' version, but so far its looking great, and with the massive support and quality they are putting into the internal version that will be landing with resellers in few weeks, we can't wait to see how amazing their dongle version will be, plus they are saying it will be 'cost priced' affordable like their internal dev board is. As you all know by now, Super Smash Bros. is coming to the Nintendo Switch, but what kind of fun is playing it on those tiny little 'Joy-Con's, well don't worry by button smashing happy, as the GameCube controller is coming back along with a nice 10 foot wired cable! PDP has a GameCube-themed controller coming just in time for the arrival of Super Smash Bros. Ultimate in December, which honors the game’s heritage and three mainstays of Nintendo’s ensemble fighting game. The wired controller comes in three designs — Pikachu, Link and Mario. The best part is the controller’s C-stick is swappable, meaning players can have a full throwback experience with the original C-stick shape and design or an updated, full size twin-analog stick control scheme. PDP did not give a specific release date for this controller, advising that fans simply check back for its availability. Super Smash Bros. Ultimate launches for Nintendo Switch on Dec. 7. It does not much yet, but @Reisyukaku has finally released to the public her 'modular custom firmware' called 'ReiNX' on a GITHub page. Future plans: I want to maintain the modularity of the codebase and focus on custom sysmodules. Q: Is your code political? A: No. My code isn't sentient enough to understand politics. But considering it runs on anyone's switch, I can assume it's at least not a bigot. This neat script was released by @rkk on Sunday, at the time it was basically useless, but now with the nice update by Xecuter with their SX v1.3 you can now make better usage of packaging up your items as 'NSP' containers and installing them via the devmenu. A .nsp (pfs0) is a simple file: a header that describes the files it contains, with said files appended to it, in plaintext. .nsp is the Switch format for installables, similar to what .cia was to the 3ds. However installing them is currently impossible, and would require signature patching. This scripts generates nsp files from whatever you tell it to. Anything goes, as long as it is a file. Even empty ones. To use it, simply drag the files you wish to repack over the script, then enter a name for your nsp. If you want to see the result, use hactool (or nstools): hactool -t pfs0 path/to/nsp (--outdir=path/to/directory). No key is required, as the .nsp isn't encrypted. CDNSP is a Python3 CDN downloader. It needs the requests library (pip install request). tqdm (pip install tqdm) is optional and will make your progress bars look better. Maybe some more, I'm not sure. for public content, it will directly download the CETK from Nintendo's servers, and extract the TIK and CERT. Cheers! To get you started, I have also included a small list of 859 TitleID's. Due to nature of this release, and fact it needs keys, and certs, and will get your console banned, there is no links, use 'google'. Application doesn't require Root on your device. SX Loader payload bundled as default. The main difference from NXLoader is the ability to quickly change the payloads you need by preloading them. You can choose any needed payload once the USB cable connected to your Switch. If you will find any issues feel free to report it. Or maybe you have some good ideas, you can also tell me about them. I am open any kind of pull requests (especially for new languages support). Find a cable to connect your device to the Nintendo Switch. For proper work, this should be a cable that is designed for data transmission, not just for charging. It is advisable to use an A-to-C cable and an USB OTG adapter. Q: Does application require Root? A: Application doesn't require Root on your device. Q: Can it brick my device/console? A: This should not happen when using the "correct" loaders. But I am not responsible for possible problems. Q: Will Recado ever run Linux? A: In the near future, this is definitely not to be expected. Maybe in the future. To be fair, I'm a noob too. My C#/coding skills are sub-par. Any help would be appreciated! As always, I haven't extensively tested this release. I'm curious how long it takes to batch trim/rename 200 files, but I don't have the time or bandwidth to test that. If you find a bug or something isn't working right, submit an issue on GitHub or reply here! Yan's World, a cute, Virtual Boy style platform game starring a pillow-throwing onion, has been in development for PC for a few years. A Patreon campaign has just been started to fund the further development of the game, including a port to the actual Virtual Boy.